The cold days of winter in Korea is definitely the season in which pork is king. Thanks to all of China's wonderful yellow dust which has blanketed Korea in the last few weeks, pork belly sales have spiked due to an old Korean wives' tales about the supposed cleaning properties of pork. In addition, we're almost through the kimchi making season, also known as kim jang, during which you'll see hordes of ajummas and grandmothers outside with enormous basins of kimchi cabbage and red paste as they get down to business, making kimchi for the year. 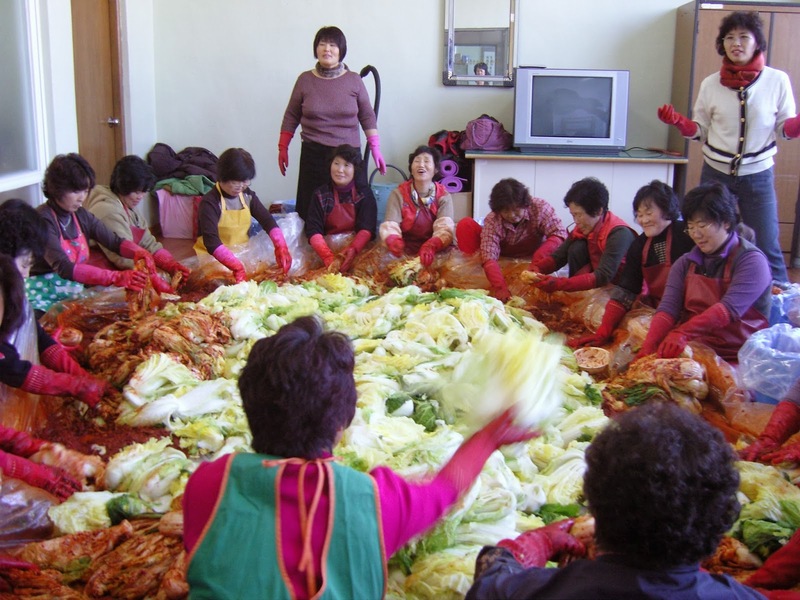 You haven't really seen "getting down low"
After the first batch of fresh kimchi is made, families will usually prepare and eat a pork dish called bossam which pairs excellently with fresh, unripened kimchi. Bossam is usually made by taking a big ol' section of pork belly and boiling it with an ish load of other stuff which boils away much of the fat, takes away the gamy smell and leaves behind tender and succulent pork meat which is eaten with the freshly made kimchi. A relative dropped by this week to drop off a tupperware mountain of freshly made kimchi which inspired me to take a stab at making this dish which turned out rather simple to do- just get the ingredients, prepare, chuck it in a pot, boil and eat. With that said, fresh kimchi is key to this pairing and I haven't (yet) made kimchi before so find or make your kimchi beforehand to go with this dish! Remember the kimchi paired here should be fresh and unripened. - About 2 kg/4.4 lbs of fresh, whole Pork from either the belly or legs portion (Ham or Picnic are the cut names in English), cut into about three chunks. The cut should be about 7.6 cm/3 inches thick. For butchers at a Korean store, if you tell them you need it for bossam they should direct you or cut you an appropriate slab. 1. To remove the blood and any residue, take your meat and cover with cold water for about an hour, changing the water once halfway. Set aside the meat while you prepare the other ingredients. 2. Wash, peel and chop your green onion into rough 2-3 inch lengths and cut the onion in half. Take the rest of the ingredients for the stock bath, except for the meat, and place in a big pot. And in goes the water. The onion, green onion, garlic, ginger, peppercorns, and bay leaves will help remove the pork's gamy smell while giving it a nice bit of subtle flavor. The coffee grounds also does the same while giving the pork a nice color at the end. If you're using coffee grounds, instead of brewed coffee, don't worry as most of the grounds will settle on the bottom by the end of the cooking process. 3. Wait a few minutes after the stock bath begins boiling and then carefully add your pork cuts, one by one, to its bath. While many recipes calls for the pork being brought to a boil from the beginning, this will lead to a much tougher and drier slab of meat at the end which no one wants. Adding the pork cuts when the stock bath is boiling will help prevent this while still drawing out the pork fat. 4. After adding the pork, bring the heat to medium and cook uncovered for 20 minutes. After the 20 minutes, cover the pot and bring the heat down to medium low. Cook for another 40 minutes. This is an opportune time to get your wrap fixings ready. Wash and drain the water from your veggies, chop your garlic cloves into slices and green chili peppers into 1/2 inch slices and arrange on a plate. Dish out the fermented shrimp and ssamjang in separate containers and bring out a generous amount of the fresh kimchi (trust me, they're going to go fast during eating). 5. Turn the heat off after the forty minutes and take out a slab of the meat. The meat will be HOT so handle with care! Make a thin cut to check and make sure the insides are all cooked. If not, throw back into the pot for another 5-10 minutes until it's cooked thoroughly. Serve hot and with rice and side dishes. To eat, take a pork slice, make a small dip in the fermented baby shrimp (some like to just pick a baby shrimp out or two and place on the pork slice) and add to a lettuce leaf. Scoop some kimchi on top and add or omit what you like from the rest (chili peppers, garlic slices, ssamjang, etc). Fold into a manageable bite and enjoy or just pretend to first feed it to the mouth of a loved one and then proceed to stuff it in your own face while s/he glares at you.